“Make your employees happy, the profits will follow” is a proven success strategy often dismissed because employers and managers confuse “happy” with “goofing off.” Nothing could be further from the truth. Make More Money by Making Your Employees Happy uncovers how successful companies make their employees happy beyond the paycheck--and reap the profits that automatically ensue from engaged employees-- increased productivity, high employee morale, excellent retention and decreased absenteeism. All this is revealed in the book with a wealth of real-world examples (Southwest Airlines, Alcoa, Costco, Starbucks) that will convince even the most skeptical reader that this approach can pay off big time. Whether your business is a Mom & Pop shop or a Fortune 500 corporation, you’ll find Make More Money loaded with easy-to-use appreciation strategies that elicit profit-making innovations from workers, catapult employee performance from average to stellar, rehabilitate poor performers, facilitate change and assure that the three generations in your workplace play nice together, all rarely costing your business anything more than a change of focus. "Make More Money by Making Your Employees Happy breaks down in simple to use concepts just how easily small changes in the behavior of managers and supervisors can drastically improve workplace productivity. Dr. Nelson once again shows how employees who feel appreciated can dramatically alter the entire work environment. This, in turn, leads to increased bottom line profits--which ultimately is positive for the employer as well as the employees. Most valuable is the detailed (and much needed) explanation of how the vast differences in workplace attitudes of Boomers, Generation Xers, and Millennials must be understood for any good manager to be effective. A quick and great read!" "Powerful, positive appreciation and recognition make people feel important and encourage employees to contribute more in the future. Appreciation forms the core of how motivated people feel, enhancing self-esteem and the all-important human connection. 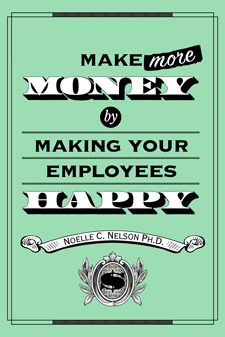 Dr. Noelle Nelson’s book shows you how to apply appreciation practically and profitably in business." "Dr. Noelle Nelson reminds us that some things in business can't be outsourced to save money. In fact, Make More Money by Making Your Employees Happy shows through research and vivid first-person accounts just how much caring leadership can contribute to the bottom line. Dr. Nelson reminds us that great people make great companies. This book provides specific step-by-step solutions on how to get the most from employees, even as companies make more money, by showing appreciation for employee contributions. Every CEO and manager will benefit by reading this book and putting Dr. Nelson's insights into action." - Steve Cooper, Co-Founder and Editor-in-Chief, Hitched Media, Inc.